Three different winners from four races have treated us to sensational MOTUL FIM Superbike World Championship action, and now 2018 heads into the third corner and accelerates into Europe as MotorLand Aragon is the host of the third round of the season. 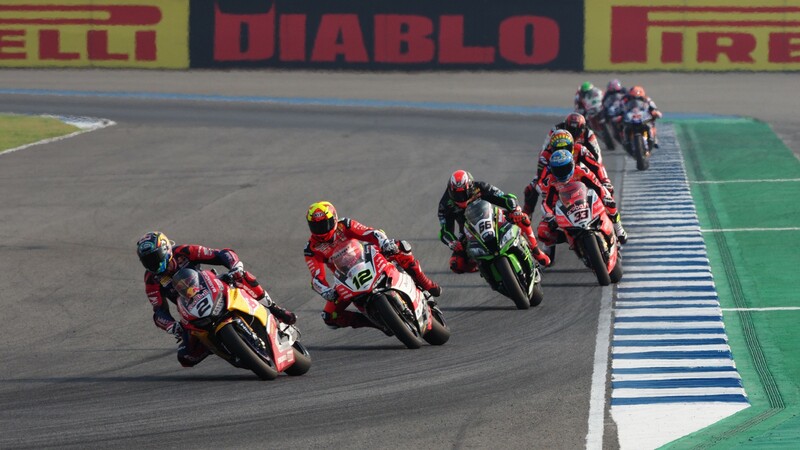 Last season Jonathan Rea (Kawasaki Racing Team WorldSBK) stunned the paddock as he took the victory in race one, but Chaz Davies (Aruba.it Racing – Ducati) came back fighting and as we head into Ducati territory, all bets are off and it’s time to be amazed. Taking back the hold of the championship lead after a tough race two in Thailand, Jonathan Rea prepares for a big fight as he heads back to his home continent. Continuing to work on the set-up of his ZX-10RR with the new regulations, the Northern Irishman will be focusing on gearing around the 5.07km circuit this time around. Coming out on top of a scintillating battle in 2017’s race one, his record here is varied but he hasn’t finished off the podium since 2013 meaning he will be pulling out all the stops to continue this into 2018. Chasing down the all-time Superpole record this weekend, Tom Sykes (Kawasaki Racing Team WorldBSK) is another rider with a strong record around MotorLand, finishing over half of the races he has competed here on the podium. A firm favorite around MotorLand, Chaz Davies will be hopeful of taking his first double victory of the season on-board his Panigale R machine, around a circuit in which he has dominated in the past. Painting Aragon red on more than one occasion, the 31 year old has an impressive history here – with six victories to his name - but with the changes made to his bike for 2018, it will be an interesting challenge to see if he can get back on top. Italian team-mate Marco Melandri (Aruba.it Racing – Ducati) won the first WorldSBK race held around MotorLand and with two podium finishes last season, he will be one to keep an eye on throughout the weekend. Impressing in the WorldSBK paddock this season is Xavi Fores (Barni Racing Team), as the Spanish rider currently sits in third position in the world championship standings and has been threatening to take a victory in the opening rounds of 2018. Heading to his home circuit, in which he has finished all races between fourth and sixth in the past, he will be looking to impress his home fans and will be pushing to make it onto the top step for the first time of his career. Putting his battle with flames last season behind him, it will be a big weekend for Fores. Fresh off the back of a double podium in Buriram, Alex Lowes (Pata Yamaha Official WorldSBK Team) and Michael van der Mark (Pata Yamaha Official WorldSBK Team) will be gunning to continue their success and take home some European silverware. As they continue to make some steps with the YZF-R1 – including an electronics update - the duo will be looking to get a good advantage at the start of the back to back. Lowes has had a tough history around MotorLand in the past, with only four top tens out of eight appearances. Whereas van der Mark secured his best result around Aragon so far in 2017 – with two top five finishes, on top of two second position finishes here when competing in WorldSSP. Continuing to turn heads with the Fireblade CB1000RR SP2, Leon Camier (Red Bull Honda World Superbike Team) sits in eighth position in the world championship standings but this doesn’t show the full story. Narrowly missing out on a podium finish in Buriram last time out, the British rider is beginning to build a strong momentum on his Honda. Scoring points with four different manufacturers around MotorLand, he has the experience behind him and is prepared for a tough fight. Making his return to the WorldSBK championship, Loris Baz (GULF Althea BMW Racing Team) has been taking his time to adjust back to the Pirelli tyres as well as get used to his German machine. The Frenchman sits in ninth in the standings, and will be hoping to make it into the top six as he returns to Europe – visiting MotorLand with MotoGP™ he has the experience in both series. In six WorldSBK appearances here, he has two top six finishes as well as two podiums in 2014, so will no doubt be looking forward to returning. Recovering from a huge crash in Thailand, Eugene Laverty (Milwaukee Apilia) will sit out of the next three races, hoping to make his return at the end of May around Donington Park. Replaced by Davide Giugliano, it will be an interesting weekend for the Italian. Lorenzo Savadori (Milwaukee Aprilia) missed out on last season’s Aragon Round through injury, so the Italian will be hoping to make a strong impact this weekend in the third round. Jordi Torres (MV Agusta Reparto Corse) brings his Italian machine into Europe, and as he heads to his home circuit he will look at impressing his home fans. Last season he struggled with the BMW, but with a solid record to his name around MotorLand – consistently finishing between fourth and seventh - it will be interesting to see how he develops the machine. Don’t miss any of the on track action around MotorLand Aragon this week, with WorldSBK taking to the track at 09.45LT (GMT +1) on Friday 13th April, before lights go out for race one at 13.00LT on Saturday, and bikes rev into action for race two at the same time on Sunday.